The Fed Has A Party Bias, But Question Is How Well They Hide It? Unless a rock has subsumed you, you’re aware of the battle between President Trump and the Federal Reserve. Does President Trump have a point? Is the Fed an independent observer or does the institution have a political party bias? These two questions are, of course, not rocket science. Of course, governors of the Fed (and the institution by extension) have agendas that favor one party over another. The question is not whether Fed officials have agendas, but rather how well do they hide their agenda. The impetus for the question stems from the following four figures. First, the number of tightening rate hikes by party. 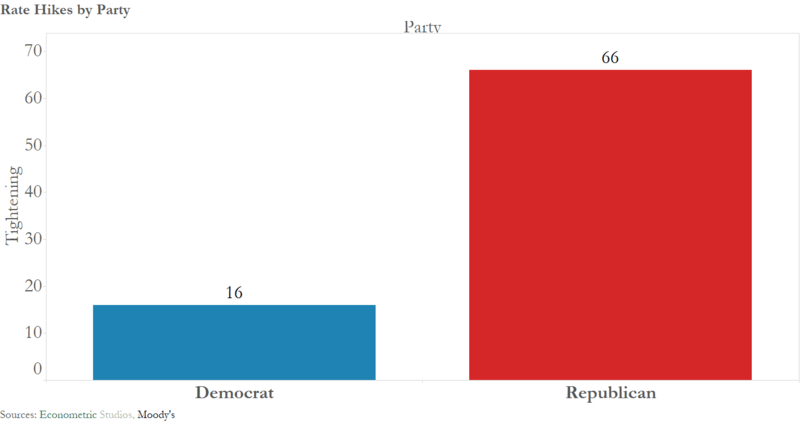 The Republican Party has experienced 66 since 1982. The Democratic Party has seen 16. The chart takes 1982 as the starting point because that is the year the Fed specifically began targeting the Federal Funds rate. The previous chart has one problem. Republicans were in power more months since 1982 than were Democrats. Because of this, one might expect Republican to have seen more Fed rate hikes. The next chart addresses this by looking at the average rate hikes per year by president. Fascinatingly, the party bias still holds. The top 3 for rate hikes are Republicans. The bottom 3 include the 2 Democrats. 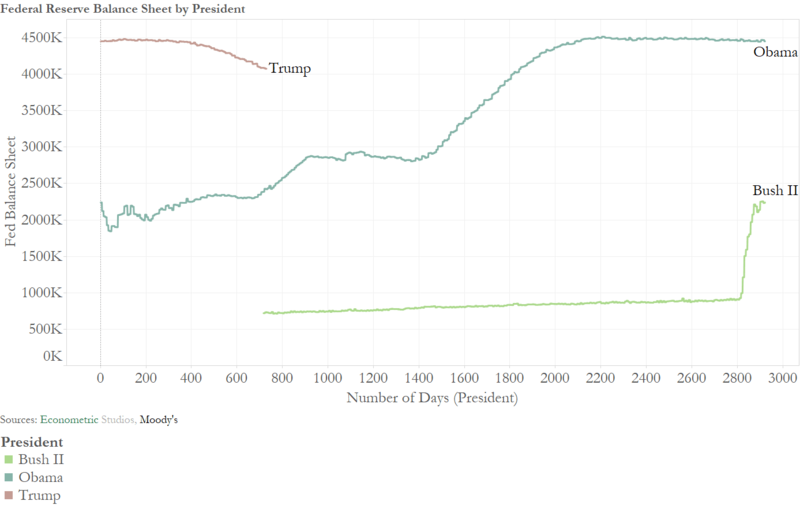 Third, this is the Fed balance sheet by U.S. president. The explosion in Fed purchases of Treasuries and mortgage-backed securities started with Bush II and then picked up real steam during the middle of the Obama presidency. The Fed’s purchases of assets have been the opposite of accommodative during Trump’s first 2 years in office. Hmm.  The economy has performed quite well over the past 2 years, but this graph still raises eyebrows. 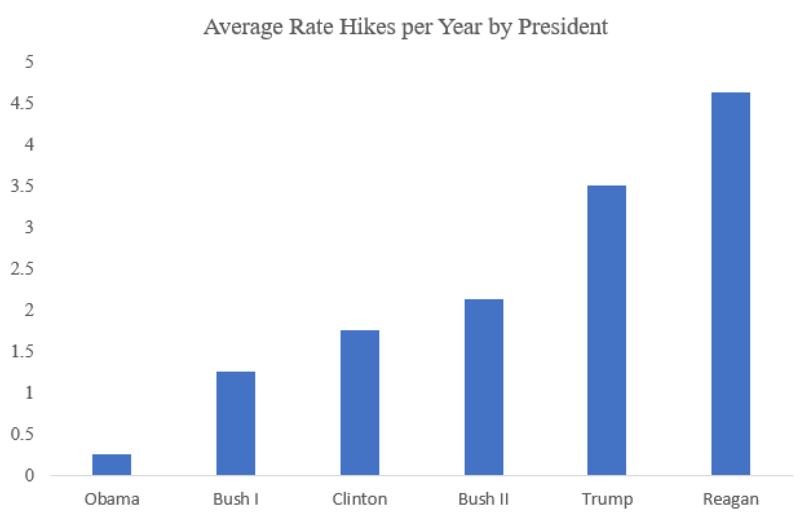 Fourth, to Trump’s argument, rates hikes through the current and past presidency. The Fed failed to raise rates through the first seven years of the Obama presidency. Then they raised it once. Then, once the election was over, they raised again before Trump came into office. Lastly, chart number 5. The Fed theoretically hikes when inflation is anticipated to be higher or when employment is strong. The following “Effects by Variables” random forest model captures the picture. Unbelievably, the results still hold. The model has the two most talked-about factors that the Fed considers but adds party to the model (party is the far right). 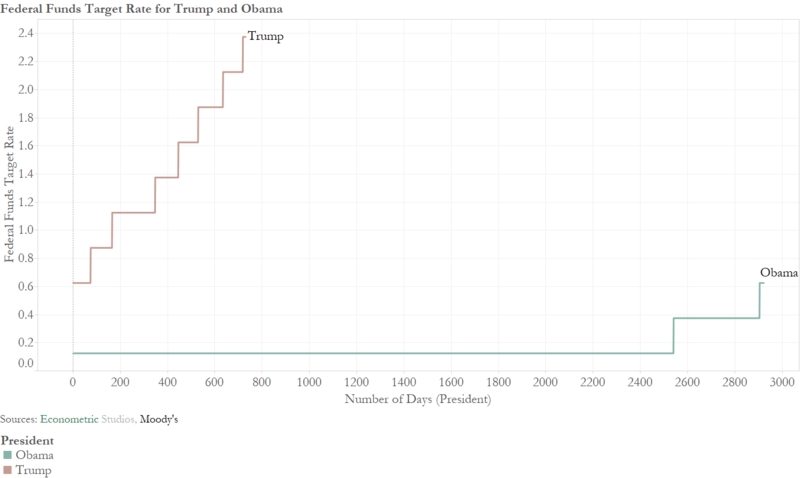 Fascinatingly, being a Republican president, you can expect a higher Federal Funds target rate even after accounting for inflation and the Unemployment Rate (this is shown in the far right portion, with Republican presidents have a higher dot than Democrats). The difference is about 1.25 percent. Hmm. In looking under the hood at Federal Reserve rate hikes, it looks as though President Trump has basis for his comments. The Fed hides its party bias. If you would like access to the data behind this graph and all other data posted by Econometric Studios, please subscribe to ValueWalk Premium. Author: Roger HarrisonRoger is an economic adviser and active angel investor. He owns various economics firms. His work allows him a diverse group of clients across the globe, including the United States, Europe, and Asia. He holds a Ph.D. in business economics.